Over the last few days you may have noticed that my blog has fallen silent. Well, now it’s back again and I hope to show you a few images from my latest trip to County Donegal, a fair old drive from County Cork. It was not my intention to just leave the blog dangling without a word of explanation, but I got a last minute call to do a quick photo shoot to promote Cork Association for Autism’s Flag Days (1st May in Cork City and 8th May in Cork County). As a result, time got swallowed up and not a single post was scheduled for the time that I would be away. On returning from Donegal I got a couple of reminders of the shoot. The first was when I switched on the television to tune in to the Atletico Madrid – Chelsea match in the European Champions’ League. Coming through the speakers were the words of Trevor Welch, the TV3 commentator and patron of the Cork Association for Autism, who I had met just a few days before in Bishop Lucey Park in the centre of Cork City. 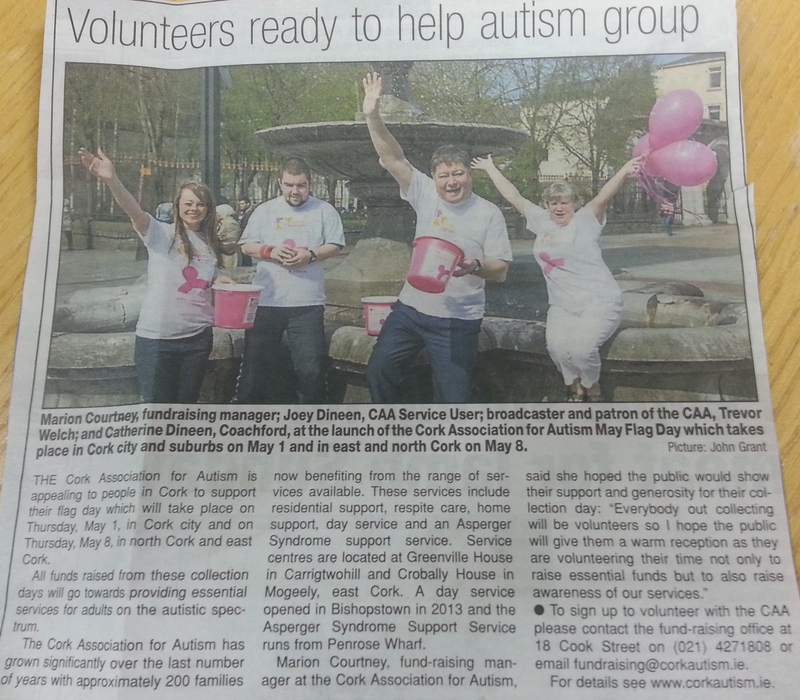 So if you are in Cork City on 1st May 2014 or in Cork County on 8th May, why not volunteer your services to help in the fund-raising efforts for Cork Association for Autism. If you are not able to give a bit of time, try not to pass by those buckets without making a small donation, it is for a good cause. So good luck to Marion and the team at CAA for a super fund-raising day on the 1st and 8th May. A man’s gotta do what a man’s gotta do 😉 and you did a god job here. Fantastic images and a wonderful cause!! Will think of you when I see the buckets and no I wont pass them by! Where in Donegal did you go? My parents are from Carrigart and Killybegs. Nice to read about the people who give their time for an important cause, nicer that you shared it! Looking forward to your Donegal series, I know they’re worth waiting for! What a wonderful thing to do! And looking forward to your Donegal photos! Thought you were quiet John. Good work on the awareness, and looking forward to see your results from Donegal.